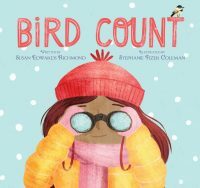 Stephanie Fizer Coleman – Peachtree Publishing Company Inc.
Stephanie Fizer Coleman is an illustrator and freelance designer. She has created the art for many children’s books and loves drawing animals. For her 100 Days project in 2018, she drew one hundred birds, one day at a time. You can visit her website here.